This week, we’ll have the two days before Lent to prepare ourselves for the coming season. Technically, Lent won’t start until Day Three- Ash Wednesday. But I encourage you to go ahead and get started with the two Pre-Season devotions. A common theme for Lent is sacrifice. We focus on denying ourselves, giving some comfort or happiness up for a season. After all, Christ gave himself for us; what would be too big to give in return for such sacrifice? In looking toward the “giving up” at Lent, there are a few things to keep in mind. First, when we rid ourselves of the excess in life (and we in the West have plenty of excess), we find that we have more than we need. We realize how abundantly blessed we really are, and we realize that Christ is all we really need. The second thing to keep in mind is not to draw attention to ourselves as we fast. We tend to put everything on social media and share everything. Fasting is best not done in such a way. It is one area of your life you can not put out there. Share with those in your household. Share with your accountability partner if you have one. Those things are fine. But don’t point out to the world how miserable and deprived you are for the sake of the cross. We do keep a list on our fridge during Lent of everything each person is giving up. It helps us keep one another accountable. But that is for our family, our inner circle. That is not for the world or social media. Last year, one of my kids gave up candy for Lent. Inevitably, the child was given candy. We instructed him to take it and say, “Thank you.” He then had the option of giving it to someone else or saving it for Sunday, the day we break fast. During this season of self-denial, let us not forget why we deny ourselves. It isn’t to be thinner or better than anyone else. – What will you give up for the 40 days of Lent? Will it be a sacrifice on your part to do so? Note what isn’t on this list. Things you shouldn’t be doing aren’t here. Why? Because you shouldn’t be doing them. Giving up fighting with your brother isn’t a sacrifice, that is something you should be working on outside of the Lenten season. Also note, I can’t give up something I don’t currently do. I can’t give up meat, because I already don’t eat meat. So, that wouldn’t really be a sacrifice for me. – What kind of reward could there be for fasting? – Should we fast on Sundays through Lent? (Parents, hint: It is the day of the Resurrection. Luke 5:33-35 can also help your discussion.) Some people do fast on Sundays throughout Lent. What you decide will be up to you, but your whole family should decide before together and all stick to the plan. Lent isn’t entirely about sacrifice. It is a time of refocusing our faith— getting back to basics, refining and resetting our priorities. It is a new beginning. That isn’t all negative. It isn’t all in the giving-up. Sometimes we need to add in some good things. One thing I am already asking you to do is commit to doing devotions as a family throughout this Lenten season. That is already adding in some good, but there is more you could do as a family and as individuals. You can commit yourself to doing more for your spiritual life. Read your Bible daily if you don’t already. Pray in the morning when you wake if you don’t already. Listen to uplifting Christian music on your way to work through this season, or turn the radio off entirely and spend the time in prayer. Read a good Christian book. Give the money you would have spent (on shopping or eating out) to a charity or your church. Commit to praying daily for a specific purpose: your church, a ministry, a missionary, families in your church, your community, your family, etc. You can find a million ways to add in the good along with your fasting during Lent. Lent is a good time to forgive those who have wronged you. Look into yourself for any grudges you may be holding, and let them go. If you know you have wronged someone, go to them this Lenten season and apologize. Commit your family to being part of your church body this Lent. I’d like to think you have this commitment all the time, but I am all too aware that isn’t the reality of the lives of most people. Weekly church attendance, participation in a small group, participation in the ministries of your church— all of these help you reorganize your priorities. If the priority in your family is anything other than Jesus, you need to tear it down and start again. Anything that keeps your family from Christ needs to go. Anything. It is the simplest, most difficult thing you will ever do, and it isn’t a task that is just done. We all need to make sure that this life isn’t getting in the way of The Life. 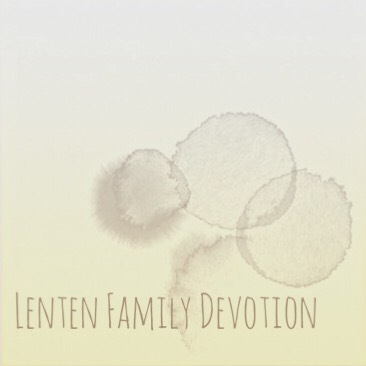 – Will we, as a family, commit to being together and doing this daily devotion through Lent? – Will we, as a family, commit to attending church every week this Lent? – What will you add in that is good in addition to the thing you are giving up this Lent? – Is our focus, as a family, on Jesus? Is anything keeping us from Him? – Have a party to start this season! Bake a cake. Get balloons. This is going to be a good season for your family! Celebrate! – What does ‘repent’ mean? – How can we prepare ourselves this Lent? – What relationship was John to Jesus? – Why do you think they called him John the Baptist? – John the Baptist snacks: We’ll not go so far as eating locusts, unless you happen to have a store near you that sells such things and you are feeling brave. Instead, we’ll be making ants on a log with honey! Cut some celery into shorter sticks. Fill them with peanut butter or sunbutter, whichever your family happens to use. Take raisins and place them along the “log” in the peanut butter. Drizzle with a little honey. Enjoy. Now, this is far different than what John the Baptist would have really eaten, but we can pretend. – Why do you think John was hesitant to baptize Jesus? – Have you been baptized? Talk about your experience. Pull out photos you might have. If your kids were baptized as babies, describe their baptisms to them, and pull out pictures or their baptism outfits to show them. – Dove Comes Down art: Today, we’re exploring the wide world of dried pasta art! Grab your white glue and pasta of choice (or multiple kinds of pasta), and let’s get started. You’ll want a base that is sturdy, like cardboard, poster board, tag board, etc. Make that blue with paint, markers, or crayons. Now, glue the pasta into the shape of a descending dove. If you need to print a template, go for it. A descending dove is the perfect shape for making pasta art because it is pretty simple. If you normally toss artwork (like I do) try to keep their Lent art for all of Lent. Find some way to display it in your home during this season to remind your family of what you’re learning. – Is temptation itself sin? – Did you notice that in Jesus’ answers, he was quoting Old Testament Scripture? – Do you think memorizing the word of God is a good way to avoid temptation? – Sneaky Snake Bread: This sneaky snake will appear again in our story. He was there in the garden, tempting the first people created to sin. He is here in this story, tempting Jesus to sin. And he’ll be hiding in the garden, hoping to see the Son of God reject the cross. The first temptation of Jesus, because he was hungry, was to turn a stone into bread. We’re making bread! If you find yourself short on time, get a partially baked baguette from the bakery. Cut slits in the bread on opposite sides and stuff the bread with whatever you want. (If you want a dessert style bread, stuff with cream cheese or mascarpone and berries. If you’d rather go for a savory loaf, try Mozzarella, basil, and tomatoes. If you want to make it for lunch, stuff it with deli meat and cheese.) Then bake it until it is brown. The alternating cuts can serve to “bend” the bread a little. You can also use olives and peppers to make eyes and a snaky tongue if you’re feeling up to it. Mix the yeast and warmish milk to activate the yeast. Wait a few minutes to give the yeast some time to adjust. Add the rest of the ingredients into the warm milk and yeast mixture. Once it is combined, turn out the dough onto a lightly floured surface and knead for 10-15 minutes. (This is enough time to give all your kids a chance to knead the dough.) Knead until it is smooth and elastic. Place in an oiled bowl and cover with oiled plastic wrap for about 2 hours to let it rise. It should double. Keeping it somewhere warm will help it rise well. Now, you’re going to use your dough to make a snake. Take some and make small stripes. Get as creative as you’re willing to get. Basically, use the dough like Play-Doh. If you’d rather let each kid make their own smaller snake, go with that. While the snake making is going down, preheat your over to 425*. Place the snake(s) on a large baking sheet. If you want your snakes to be lovely, I would suggest an egg and milk wash. (Whisk one egg and 1 T of milk. Brush that onto the top of the bread before baking.) It’ll make it shiny and beautiful and super-impressive-looking. Bake your snakes until they are golden brown. Serve them as a snack or with dinner. It is up to you how you consume your snakes. – Listen to the song A Stick, A Carrot, and A String by mewithoutYou. – Have you ever thought about just how crazy this all was? A stranger is coming and asking a bunch of guys to follow Him around. – Why do you think these twelve were the chosen ones? – Why do you think the religious officials were surprised that Jesus was spending time with tax collectors and sinners? – What does Jesus’ response tell us about who He is? – Follow the Leader: Take turns being Jesus. Jesus says, “Follow me!” Then we follow along the way He is going. If He jumps, we jump. If He crawls, we crawl.